Hi there, hope you will enjoy these English Norwegian Translations Helpful Terms I picked out for you to peruse and learn. I have discovered that it is easier for me to learn and memorize a language and build my vocabulary when I read everything out loud and write the vocabulary down. Of course, we need to do keep repeating what we want to memorize. Below are some English Norwegian Translations Helpful Terms that you can study on the plane on your next trip to Norway. Sure, it would be very nice to know the Norwegian language. However, most people will not take the time to do that. The next best thing is to know some important words and phrases in Norwegian. Want to impress the Norwegian Vikings that you will run into on your trip? OK, then tuck the translations below into your vocabulary toolbox, but wait, first, I will show you my method on how to Pronounce the Norwegian Alphabet. English Norwegian Translations Helpful Terms. Do you have a girlfriend? Har du en kjæreste (male or female)? I am married. Jeg er gift. Are you engaged to be married? Er du forlovet? I am engaged to be married. Jeg er forlovet. Here are even more English Norwegian translations helpful terms Her er enda flere engelsk norsk oversettelser nyttige utrykk. Do you have family in Norway? Har du familie i norge? Do you have relatives in Norway? Har du slektninger i norge? I have relatives in Norway. Jeg har slektninger i norge. I would like to have contact with my relatives in Norway. Jeg vil gjerne ha kontakt med slektningene mine i norge. Do you have a picture of your family? Har du et bilde av familien din? See you again. På gjensyn. 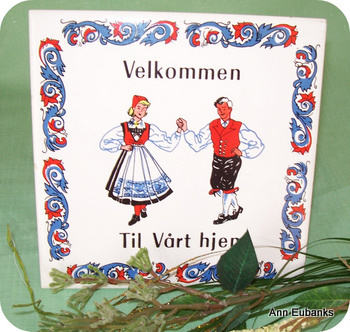 Find English Norwegian Translations Cooking and Baking Terms here. English Norwegian Translations Herbs and Spices.